The Palm Paddle has been designed by Martin specifically to develop a good front crawl stroke and lets the swimmer know if that the hand movement is maintainin the correct path during the whole stroke. The unique design encourages the swimmer to use his/her forearm to hold water – developing the ‘early vertical forearm’ (EVF). 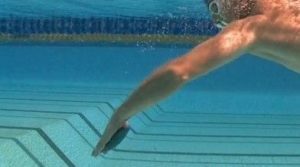 Palm Paddles replicate the “fist drill” – but retains the swim-specific positioning of the hand throughout the stroke cycle.